Eva Alexander and her family are looking at an apartment after being evicted from their house. Eva decides to take the place and the landlord tells her that he will get her the keys after a credit check and her payment goes through. He offers to give a recommendation for a moving company but Sam Alexander says he will be able to move them on his own. After they drive for a few miles, Sam asks to be dropped off. He tells his mom that he'll be home late and not to wait up for him. As Eva drives away, Sam puts on the Nova helmet and flies off into space to meet a friend. Ten minutes and fifteen light years later, Nova finds Rocket Raccoon sitting on top of a pile of alien soldiers he's just defeated. Sam begins to tell his friend about Jesse Alexander and the vision he had seen of him killing another Nova. Before he can get too far into his talk, Rocket Raccoon turns to shoot at another group of mercenaries who are running towards them. The soldiers decide to just stay on the ground until the two leave. As Sam and Rocket walk into the nearby small town, a soldier tries to sneak up on them. Nova sees and blasts him but not before the mercenary calls for backup. The raccoon tells the Earth hero that it's time for them to go. The two get into Rocket's spacecraft and launch into space. As they warp towards their destination, Sam gives his alien friend more details of the vision he received from the exploding Watcher's eye. He reveals that Jesse murdered a defenseless Nova Corpsman and had been with an alien wearing a Black Nova helmet. Rocket becomes angry when he learns the alien's name was Adomox! Rocket snarls that Adomox owes him money. Rocket Raccoon also reveals to Sam that Adomox was one of the first Black Novas and was the one who drafted Jesse into the group. He also suggests that Sam try to find others that knew Jesse such as Cosmo or Titus. Rocket explodes into laughter when Nova tells him that he blew Titus apart with the Ultimate Nullifier. The ship comes out of warp at their destination. Rocket Raccoon tells his Earth friend that this is where Adomox has been hiding himself. Nova turns to see an enormous complex of abandoned or stolen space vehicles linked together to form Oblitus! Rocket informs Sam that Oblitus is a lawless island in the stars and Adomox, as a casino owner, is one of the most powerful men on it. He decides he will kill everyone in their way to get to their target. Nova suggests they should try subterfuge instead. Later, a ragged youngster with a raccoon cap wanders into the casino and heads for the elevator. However, a large bouncer inside the elevator asks him for his name and reason for being there. The teenager says his name is Sam and he's performing a magic act in the casino. When he demands to see a trick, the bouncer finds himself beaten unconscious by Nova and Rocket Raccoon! The two enter the residence of Adomox. Rocket quickly kicks the alien who owes him money to the floor while Nova slices Adomox's security robot in half. The raccoon Guardian tells the fallen alien that he wants his money and that Sam wants answers about his father. Nova begins to interrogate Adomox while Rocket Raccoon walks over to deal with the incoming guards. Adomox suspects that Sam is the son of Jesse Alexander. 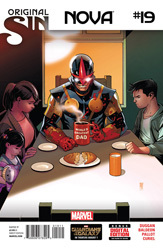 Nova asks why did his father murder a Nova. The green alien inquires if Jesse had disappeared into the Cancerverse along with the rest of the Nova Corps. Sam demands an answer to his question. Adomox responds by asking him what he thinks was Jesse's role in the Nova Corps. Nova tells him he thinks the Black Novas were an elite special forces group within the Corps used to perform extreme missions. Adomox informs Sam that he is wrong. The Black Novas were never part of the Nova Corps. The group had formed on its own due to their belief that the Nova Corps wasn't powerful enough. He further explains that members of the Nova Corps were allowed more access to the Nova Force as they moved up in the ranks. Adomox felt the problem was that only a few had access to real power in that organizational structure. The Black Novas created the Black Nova helmets to allow them to access the Nova Force without restrictions. The former founder of the Black Novas also reveals that Jesse Alexander killed the Nova because the Corpsman was going to reveal the group's existence to the leaders of the Nova Corps. At the same time, the green alien presses a button underneath the table. Adomox finishes his story by revealing that the Black Novas were captured by the Corps shortly after Jesse left the group. The Nova Corps confiscated his Black Nova helmet and now he wants it back. Sam offers to give him a Nova helmet since he has a number of them at home. Adomox says he doesn't want any regular Nova helmet. He shows the teenager from Earth a helmet he found after the Nova Corps was wiped out during the Thanos Imperative. It's a Nova Prime helmet (it's not stated if it is the helmet of Richard Rider or Malik Tarcel)! However, the former Black Nova cannot get it to work and wants a Black Nova helmet instead. During the conversation, Sam notices that Adomox inject himself with a liquid. The alien tells him that it is an antidote to the poison he released into the room earlier. He offers to give Nova and Rocket Raccoon the antidote in exchange for them completing a mission. The Black Novas had a bunker on a remote world which housed a machine that programmed their helmets. The coordinates for the planet are on a chip that the alien hands to the Earth teen. Adomox wants the machine brought back so he can reprogram Sam's Black Nova helmet for himself. Nova and Rocket Raccoon reluctantly agree and walk out of the casino.